Who says you can’t have breakfast for dinner? This is my Spanish Omelette: Onions, Green Peppers, Garlic, Bacon and Mild Cheddar Cheese topped with Enchilada Sauce and Green Onions. On the side is a Naval Orange with a flower shaped Stawberry cut in the center. I love breakfast for dinner. My favorite kind of food! Looks good. I love breakfast for dinner! 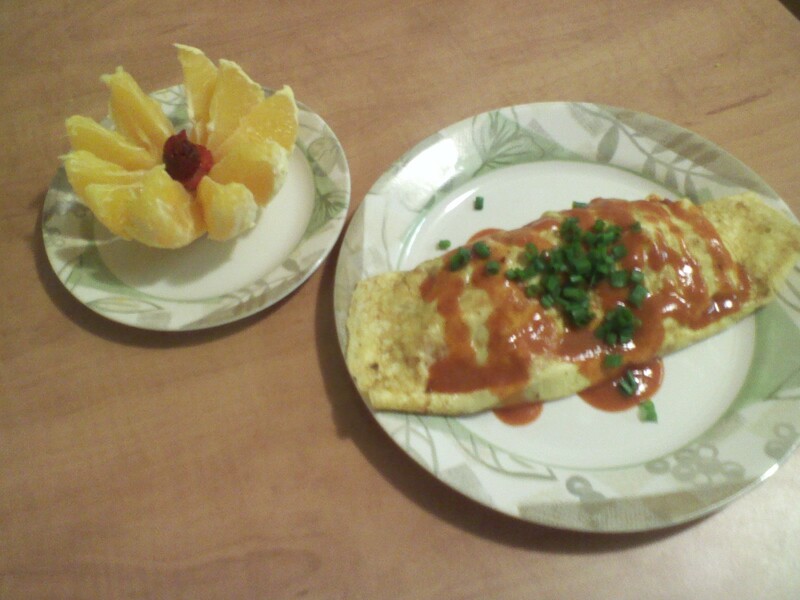 Your omelet sounds really good! Breakfast for dinner is sometimes NICE. Last night, I had breakfast for dinner as well. Omelette with red peppers, mushrooms and spicy turkey sausage topped with Parmesan and mozzarella cheeses. I do the half-fold with mine though. I always have breakfast for dinner! Love it!